The 5th edition of the Grand Chess Tour is expanding into Asia and Africa, with rapid and blitz events in India and Côte d'Ivoire, while there are also new European tournaments in Romania and Croatia. The latter is a boost for fans of classical chess, as it’s an 11-round classical tournament featuring all 12 regular players. Combined with the Sinquefield Cup, classical chess will now make up 50% of the available points before the Final Four is again played during the London Chess Classic in December. We have all the details, as the tour grows from five to eight events. 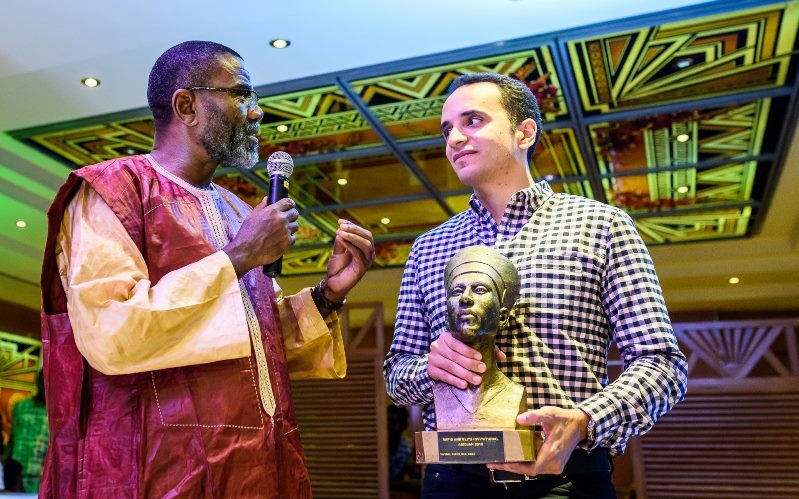 There was a trial run last year with the Côte d'Ivoire Rapid and Blitz Invitational, an all-African event won by Egypt’s Bassem Amin. 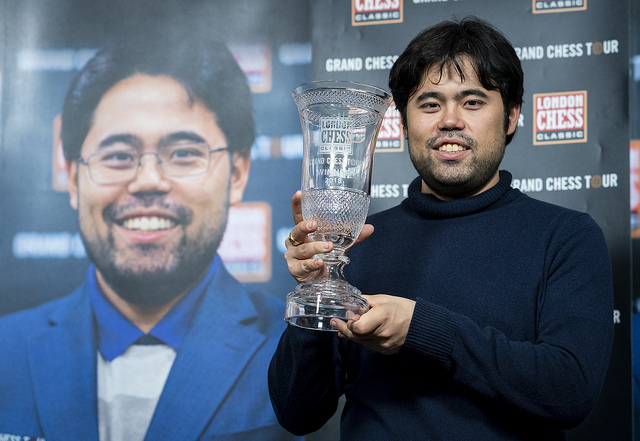 The Grand Chess Tour will also now incorporate the Tata Steel India events in Kolkata, India, that last year were won by Hikaru Nakamura (rapid) and Vishy Anand (blitz). 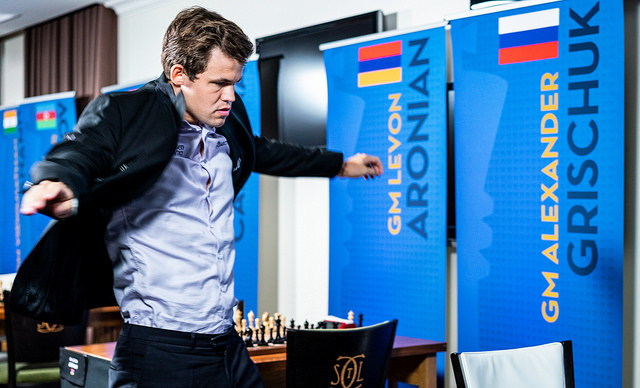 Of course the tour will also feature America - the Sinquefield Cup and the St. Louis Rapid and Blitz, and Europe – where the Paris Rapid & Blitz and the finals during the London Chess Classic continue, but the YourNextMove event in Leuven, Belgium has gone to be replaced by the Superbet Rapid & Blitz in Bucharest, Romania and a new tournament in Zagreb, Croatia. That brings us to the organisation of the tour. 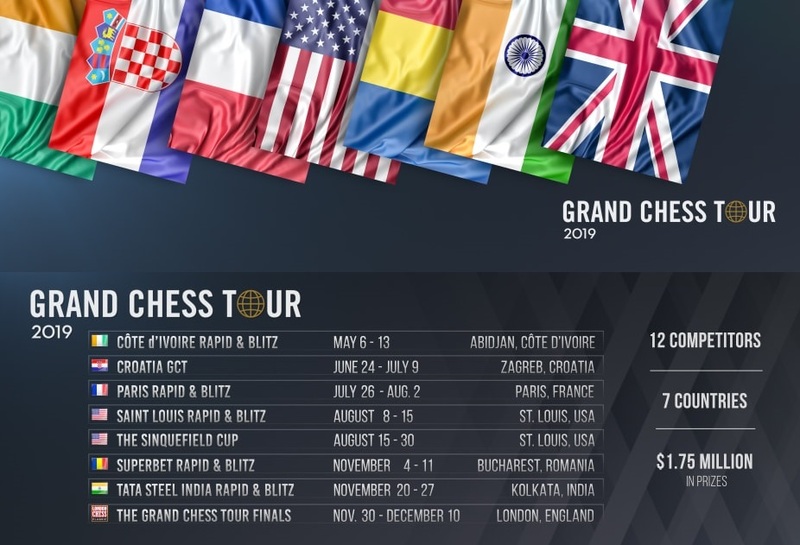 The Grand Chess Tour began in 2015 by bringing together three classical tournaments, Norway Chess, the Sinquefield Cup and the London Chess Classic. By 2018, however, it had become largely a rapid and blitz series, with only the Sinquefield Cup remaining as an exclusively classical event. This year that’s set to change again, with players able to earn half of their points and more than half of their prize money in classical chess. Instead of the 9 regular players in 2018 there will be 12 in 2019, with all 12 of those players competing in the Sinquefield Cup and also a new classical tournament in Croatia, the adopted homeland of a certain Garry Kasparov. The classical tournaments will now be played over 11 rounds, though the time control has been shortened “to promote fighting chess” – instead of 100 minutes for 40 moves then an extra 60 minutes to the end of the game, the players will have 130 minutes for all of their moves, with no respite at move 40. That means they can, if they choose, take more time at the start of the game, but time trouble is likely to be a big factor if the games drag on. Once again the Grand Chess Tour has chosen to use the American system of delays rather than increments. That means the clock doesn’t start counting down until 30 seconds after a move, but the players will have no way to build up time on their clocks – if you’re down to 1 second you can keep taking 30 seconds each move, but there’s no prospect of leaving the board until the end of the game! There’s also no easy way out by offering a draw, since draw offers aren’t allowed in the classical events. In 2019 there were three 5-day rapid and blitz tournaments, which had to be played by all tour regulars, with just one wildcard for each tournament. This year there are now five tournaments – the 3 days of rapid and 2 days of blitz format remains exactly the same – with each regular obliged to play in three of them. All of a player’s scores will count, with 18 (20 for clear 1st) points for 1st place in a classical event and 12 (13) for rapid and blitz. That means there will be plenty of room for wildcards in the rapid and blitz events. A Grand Chess Tour press release mentions “fourteen event level wildcards”. Once again the top four players will compete in the finals in London, though so far the exact format of that event hasn’t been released. This year there’s a total of $1,750,000 up for grabs, a $700,000 increase on 2018. The prize fund for the rapid & blitz events remains $150,000, with $37,500 for 1st place. The prize fund for the classical tournaments has increased from $300,000 to $325,000, with $90,000 for 1st place, and the prize fund for the London finals is up from $300,000 to $350,000, with the top prizes up from $120,000 and $80,000 in 2018 to $150,000 and $100,000 in 2019. Magnus Carlsen, the winner of the tour in 2015 and 2017, has already said he’s very likely to play, but one player we won’t be seeing is Vladimir Kramnik, who last week announced his retirement. That means an invitation for the first reserve, Sergey Karjakin, while the second reserve is Yu Yangyi. The chances of his playing are significantly boosted by what’s likely to be a jam-packed schedule. UPDATE, 7th February: Only Vladimir Kramnik rejected his invitation, and he has now been replaced by Sergey Karjakin.